Left foot forward (a journey into reenactment): W a t e r l o o, part Three. 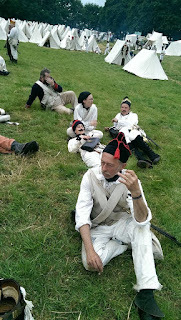 Another six o'clock start and musket cleaning from yesterday which I got down to quite quickly after our breakfast of Crepes and black coffee. More drill.. turned out that the Scots Greys had attacked the wrong unit yesterday and today we, or rather our battalion, would be on the receiving end of a lot of cavalry so time was spent on a hopefully simple maneauver to form a mass that was four ranks deep by having the two leading groups turn, take three paces and hurry back to double up besides that behind, all presenting 'bayonet' outwards. Apparently the Scots Greys had a plan to bring an Eagle over and then capture it from us as they historically did, however no attempt to organise anything either before or during the event had been received yet we were not sure if they might try and take the one we had without asking, so practice was good, and an attempt would have been bad form and potentially dangerous, people can be injured punching cavalrymen in the face. We had some spare time in the afternoon and I fancied going to see Hougoumont but I also fancied a nap and not being late back. After lunch and a short lie down I decided to stay in camp but it was very busy with visitors, being the weekend now, and only Rob was in full kit, I thought I'd kit up from whites into most of what I would take on the field and also help with talking to people. A lot of people stopped by to chat and ask questions, and an amateur film making company wanted to interview people, and I also volunteered. It was meant to be first person as a French soldier, as if in character.. 'In character' is a concept some people seem to have that reenactors have specific names/roles/personalities different to their own, a bit more like a Live action role play character, but nearly everyone is just themselves, in Napoleonic kit. They wanted me to shout a war cry and Duncan reminded me that Vive L'Emporeur is pronounced 'Vive L-umprur' not 'Vive Le'Emporeur' hopefully I got it right but then as a first person I found myself doing a cod-French accent and hoping to give a good impresion as questions were sprung on me. 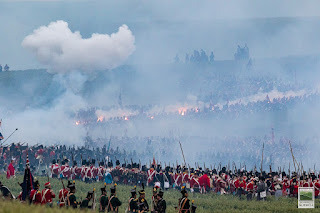 Seems a lot of people had not had a fabulous experience seeing the battle yesterday, not because of us but all the smoke.. being sat too far from any action.. not understanding what was going on.. or all three. Apparently the narrator, who spoke only in French, had been sacked half way through due to a poor delivery and possibly being a bit pissed. Things kicked off as before but it seemed now we were to follow a bigger unit down the slope, support them from the rear and then retreat as the attack failed. Once more stomping into the wheat. 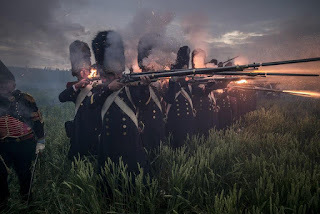 However we did not stay in retreat and marched closer to the enemy, fending off several cavalry attacks and using the threat of fire to halt any silly ideas. We then traded rounds with the British and one of them went down injured, this causes a worry as no one can hear what the problem is, and is signified by someone in the group holding a musket up with both arms so they are left alone. French cavalry attacked just as our Colonel was crossing the open ground to see what the problem was, apparently deafness or black out caused by percusion too close to his ear. More shooting but my flint had lost its edge and every time I went to get a flint out we seemed to up and move, I had loaded a generous cartridge and cleaned out the frizzen, going through firing motions.. when I seemed to have a minute or two to change it. 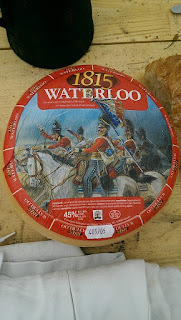 I loaded a generous cartridge (special 45eme Waterloo paper) and fired with the next volley. BADOOOM! (farkin'ell). Yes, I had double shotted, except it was closer to triple shotted with those cartridges. It certainly cleared any blockages. yes. normally I would never stand with a phone/camera up, but the public had no video screens and were never going to seen an individual going anything at that distance in poor light. Still I felt a bit conflicted about it, maybe phones were his crisps. Back into action and we outflanked a battery of allied artillery, wheeling to give fire. in a real battle we could have rolled over the entire gun line, but no, we were meant to lose, and whilst Duncan had used his initiative to get us more engaged we were not allowed to win the battle on our own. Back up the slope, people tiring a bit, and I had, for the first time at an event taken my glasses off because they were steaming up. Just when we thought it was the end, with men retreating everywhere under fire, orders came for us to support the Imperial guard in the final attack and we marched down again. Facing a unit of redcoats who were genuinely surprised and disconbobulated by us coming in again for a renewed assault.. were the French going to win after all? No, we fell back, the Guard were faltering and we didn't want to get left behind. One last trudge up the slope and trying to avoid being dragged off anywhere else, twice forming up as roving cavalry came near. Today we wanted to try and stay in formation to march back. We were cheered again, and I gave them a 'Vive L'Belgic!' back, 'Creep!' someone japed but I pointed out we had just lost a battle in a foreign country, I didn't intend to get turned over to the Prussians! The battles were done. No more drill. No 6 o/c reveille. The event a success. Tomorrow the last day for most. What to do you think happened? Mostly people got drunk. 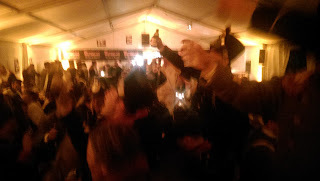 In the beer tent singing escalated up to 'The Marseillaise' with people standing on tables, waving bottles and stamping Feet, and barely an actual French person between them. Those of us there went back to the Sappeurs tent (it had started raining almost as the battle ended) and carried on, with a few songs here and there until it was time to hit the straw. 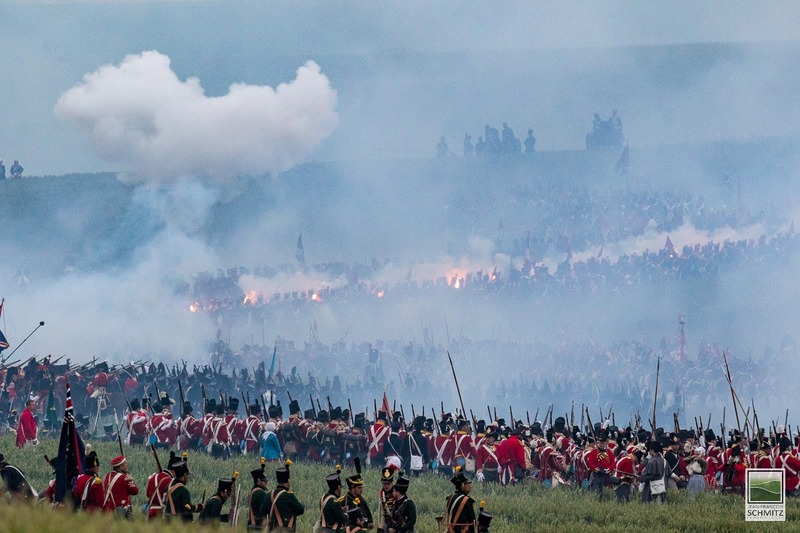 Packing up camp is always sad, mainly sad, unless the event was a wash out and this certainly wasn't, John Flapjaques proclaimed it the best Waterloo ever for him. We went and looked at some stalls and got a couple more souvenirs, and had some very good ravioli. and so, away. The event that had been spoken of for the last ten years had come and gone. Biggish events would still happen.. but where? Marengo? Austerlitz? Talevera? Wagram? Nothing needs to be overshadowed by that years 'big draw'. 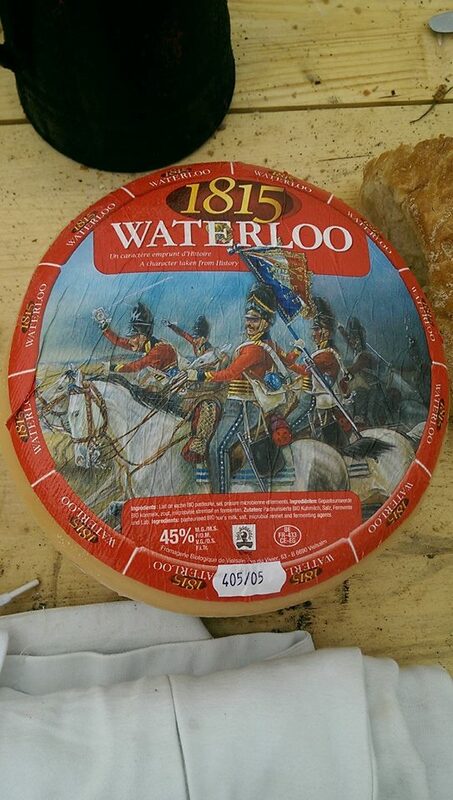 I am left with many memories of those six days in a usually quiet three mile stretch of Belgium, the big cheese of Waterloo, long in ferment, had been devoured. Excellent commentary, particularly interesting to read as one who fought on the opposite side to my "home" unit. Yes, having seen some photos and videos from the otherside, such as being in the farm bastions, gives another perspective.